Contibutor with RTÉ LifeStyle, fond of wildlife and the great outdoors. The phrase ‘the most wonderful time of the year’ is not traditionally associated with Halloween but as far as I'm concerned the year hits it peaks in October every year. Unlike the Christmas period, life goes on but the average day becomes more fun, punctuated with homes draped in cotton wool cobwebs and local kids road testing their costumes before the big day. Everyone has their own traditions at this time of the year - building bonfires, baking a brack or bobbing for apples – but how did anyone come up with these ideas in the first place? And while many will say that, similar to Valentine’s Day, it’s an occasion celebrated to benefit the commercial, Halloween actually has humble roots far closer to home. The festival stems from the Celtic celebration of Samhain marking the end of the harvest season and the beginning of the Celtic New Year. The people believed that during the night of October 31st into November 1st the barrier between the realm of the spirits and the real world grew weak. This allowed the dead to return to earth for one night only before New Year’s Day on November 1st. But the Celts were frightened of the dead and built large fires to drive them away from the living during the night. With the spread of the Roman Catholic Church the festival was incorporated into the church approved All Saints Day –church authorities did not approve of pagan rituals. All Saints Day took place on November 1st and honoured Christian martyrs and so the night before was All Saints Eve. When the church merged All Saints Day and the pagan festival it became known as Hallomass. Hallo meant saintly and so the name is meant to mean mass of the saints. However, the 31st was called All Hallows Eve which eventually became known as Halloween. How did a Celtic festival go global? 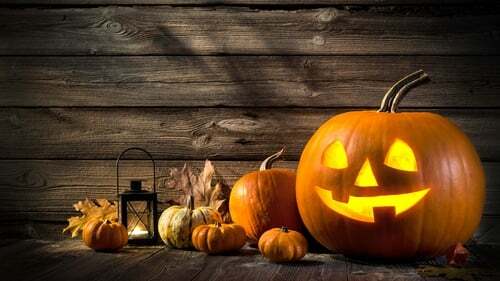 During the famine in Ireland, more than a million people emigrated bringing with them a variety of Irish traditions and customs among them Halloween. The festival rapidly captured the popular imagination of American society and spread across the country. In America, Halloween is big business and worth several billion dollars to the economy every single year. Trick or Treat? How did that all start? There are a number of theories. There are reports from medieval times of children dressing up and looking for alms in return for entertainment but the popular term had not yet been coined. At one stage in the 20th Century, the jokes played at this time of the year got out of hand. People wore masks while vandalizing property so they wouldn’t be recognized. As such trick or treat was more of a threat than a beloved holiday saying. It was a case of 'give me what I want or I’ll wreck your house'. In a bid to avoid trouble, many neighbours and shopkeepers began to offer sweets to placate vandals, many of whom were young in anticipation of the night. Why do we carve faces in pumpkins? Pumpkins are one of the most iconic symbols of Halloween for a number of reasons. The vegetable was traditionally harvested around October so the bright orange vegetable became associated with the harvest festival. There are two main theories as to why people carve pumpkins at Halloween. Firstly, the Celts, concerned about the evil spirits at Halloween, carved scary faces on turnips and put a light inside toward the spirits off their home. Secondly, according to legend, there was once a man in Ireland called Stingy Jack who was a general troublemaker and disliked by everyone. The story goes that Jack tricked the devil into picking up his tab while drinking with him in a pub by turning himself into a silver coin. However, he then put the coin into his pocket with his crucifix forcing the devil to remain in his monetary state. Eventually, he freed him and made him promise not to take his soul but when he did die, he was left with nowhere to go because he was not welcome in heaven and the devil wouldn’t have him in hell. So the soul of Jack (who hadn’t been very popular with the Irish people as it was) continued to roam the country. Some say that people carved turnips with evil faces to keep him away from their homes. Other stories tell of how when he didn’t get into hell the devil gave him a flaming piece of turf which he put inside a turnip and carried around to guide him through purgatory. How did we end up bobbing for apples? A vital part of Halloween and perhaps what makes it so appealing to kids sweets aside is the games. Although associated with Halloween, bobbing for apples is actually the historical equivalent of an online love calculator test. For women, the apple represented the man they wanted to marry and the number of tries it took to catch it represented the likelihood of that dream becoming a reality. If she got it in one they were destined for one another, two goes and things were not looking so good in the long-term relationship, any more than that and all hope was abandoned. What other traditions can I try? Before kale became the nutritional buzzword of the day it was a vital ingredient in a Halloween favourite dish curly kale or colcannon. Made with potatoes, kale, onions and butter, the dish is all mashed together. While it doesn’t look very pleasant, the tradition is to hide coins in greaseproof paper in the mix – likely to simply try to make it more appealing for children. A Halloween brack is another popular tradition with hidden value. The loaf usually contains a ring and whoever finds it will be the first to get married according to tradition.